Have you always wanted to own a KitchenAid? Well, now is your chance to win one! 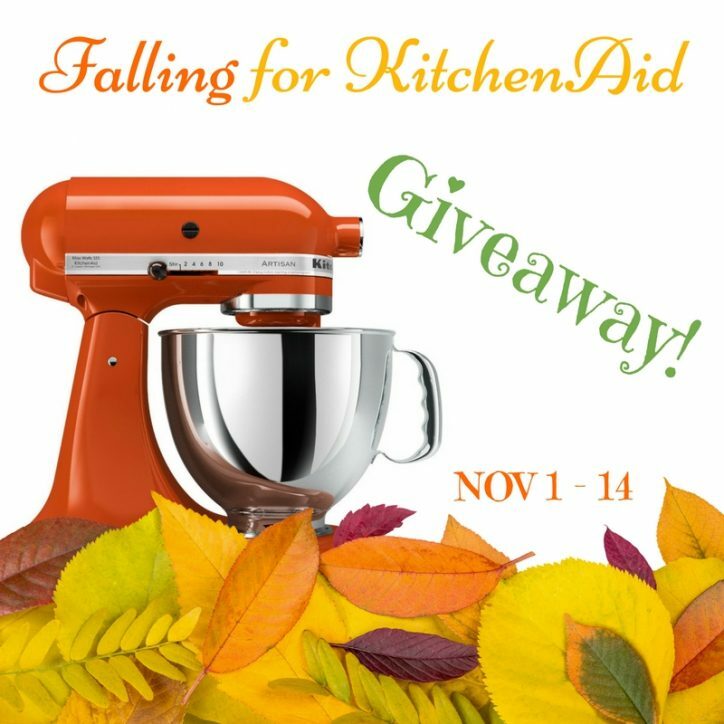 This is a Falling for KitchenAid Giveaway! Blackberry Babe, Coupons and Freebies Mom, Monica’s Rants Raves and Reviews, Moore or Less Cooking, Kelly’s Lucky You, Vegetarian Mamma, Scrumptious Moms, Amee’s Savory Dish, Conserva Mom, Little House Big Alaska, The Whimsy One, Dorky’s Deals, Inez By Design and Pinoy Recipe. One lucky reader will soon be mixing up all kinds of goodies with this Kitchenaid 5qt Artisan Stand Mixer! The winner will have a large selection of colors to choose from, so if you aren’t into Persimmon you can choose your own color! The first thing I want to make is some type of bread. The first thing I would make is sugar cookies. Would enjoy an having a kitchenaid <3 I l love baking. I would be making a lot! I would be doing much more baking, cakes from scratch and cookies. Want to also make homemade pierogi and pasta! The first thing I want to make is a vanilla buttercream cake! I would love to make a Toffee Cream Cheese Pound Cake! The first think we would make are Christmas Cookies!! I would make my Mom’s bread dough… and would LOVE to be able to do so for my Dad. I’m thinking I would make mashed cauli-tatoes first. What a pretty mixer! Finally got to enter! I would definitely make some Christmas cookies!! Entered. Just in time for baking season! I’d make a Red Velvet Cheesecake! The first thing I would make would be pumpkin cupcakes. I just love pumpkin recipes so much! Great idea!! Can’t wait to try them!